Georgina Blaskey discovers the innovative ways to make rooms in your home work doubly hard for you. In the city, space is always at a premium so clever solutions that give rooms more than one purpose are increasingly popular and imaginative. It can feel ridiculous to create a beautiful guest room that’s only used a few times a year or waste a wide corridor on nothing but a passageway through the house. 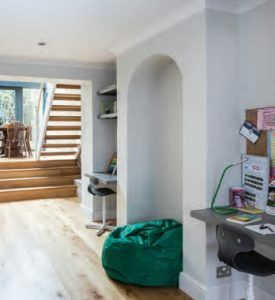 Architects and interior designers, joiners and project managers have created some innovative ideas to maximise the space under your roof. 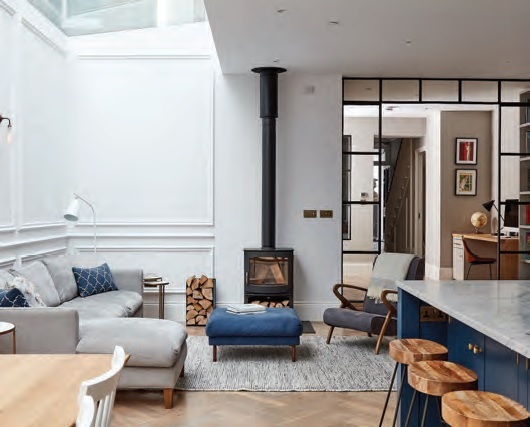 For example, dRAW Architecture had a challenge on their hands when they converted a mews house into a luxury home as there was no outside space. 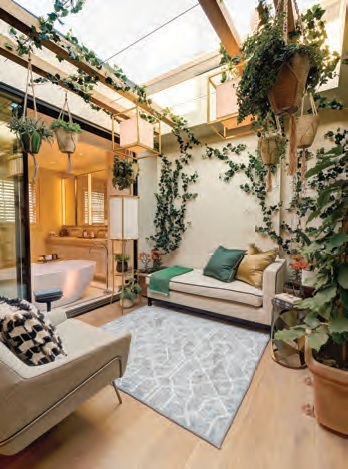 By creating this internal upstairs courtyard, the architects were able to flood the house with light, give the owners a space in which to relax and see the sky – it has a retractable roof – and give both the master bedroom and bathroom a stunning view. With access to the courtyard available via the hallway, it also provides an entertaining space for friends, and furnishing it with plants and upholstery has created an interesting dynamic, like a conservatory and roof terrace rolled into one. The options are endless. 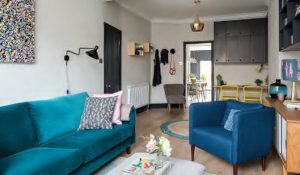 Utility rooms can double up as boot rooms, guest bedrooms can also offer somewhere to work, a playroom can be a cinema and wide hallways can hide a multitude of clutter, with fitted storage units and built-in cupboards. Already, most of our homes are making good use of the ‘back’ room of the house, for somewhere to cook, dine and relax. Basement conversions are also becoming dual purpose spaces, with a bar, cinema screen and play area, for example. In its purest form, a smart console table can double up as a desk with enough room for a laptop and some paperwork. But when you want to entertain, clearing away office items into slimline drawers will maintain the mood of your entertaining space better than a functional desk in the corner of the room. Creating boot rooms in family homes is now a big trend and often incorporated into projects. The boot room is an extension built out into the side return area, usually accessed off the main hallway at the front of the house or, where there is the space, with its own entrance. In homes on larger plots, a boot room can be built into a new-build side extension by filling in the side passage. It can be more difficult to achieve in a terraced house unless you include it in a basement project. A boot room is for all the things associated with outside, a zone with benches and hooks for children to remove muddy wellies, shoes, coats, scooters, cricket bats and the rest! All the clutter can be kept together in one space, away from the rest of the house. Larger boot rooms can include a WC, utility area with kitchen surface and a pulley rail overhead to dry clothes. Stylish yet simple storage is worth its wall space in gold. High cupboards for box files and work clutter keep your living space clear while allowing easy access to vital documents when working. Bold chairs brighten up this cosy corner and an anglepoise light helps when you’re on task. 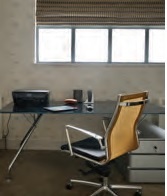 A fold-down desk within a built-in unit is the epitome of streamlined design. Create a computer-friendly set up with strip lighting and you can get to work quickly when needed, and shut down just as fast. It’s a short walk to the sofa after your job is done – but here, out of sight really does mean out of mind. Hallways aren’t just the preserve of shoe racks and umbrella stands. 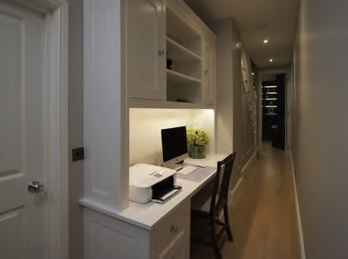 This cleverly designed corridor office is neatly executed with plenty of storage, ample lighting and no distractions – a perfect spot to hide away undisturbed. What could be seen as a redundant space is given purpose with this children’s study. Linked in to the dining extension, yet far enough away from the kitchen and living room to keep distractions to a minimum, this light-drenched room is bright and airy for small minds to buzz. 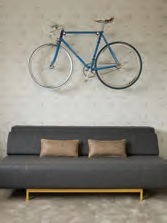 Innovative bike storage on the wall creates a focal point and the sofa underneath easily converts to a guest bed when needed. This small space is a masterclass in planning. A pokey room has been fitted out as a TV den and study area, with equal importance given to both. Dark wood joinery adds richness and warmth, absorbing the screen into it, while also housing a desk and computer. Well-designed lighting and a black-out blind both help switch the ambience in seconds between work place and cinema room. Make your double reception room work harder when space is at a premium. The traditional Victorian terrace footprint has been opened up but subtle elements both unite and divide it. The chaise longue acts as a physical barrier between the formal sitting room and the playroom, but the joinery style creates a more gentle division. 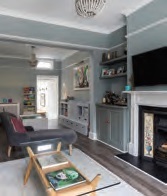 By painting both rooms the same colour, mirroring the TV with the painting and installing identical ceiling lights, the flow of the space is maintained, perfect for when the playroom is no longer needed. 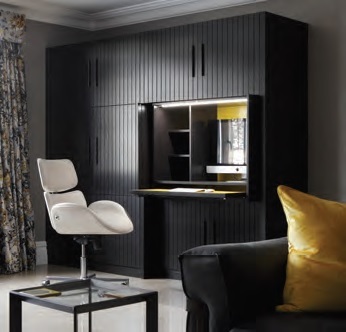 Hiding away in a study bedroom can be the answer in a noisy house or where downstairs space is tight. This room has a large desk under a window to flood the work area with natural light, and space for all the tech required. Think about the practicality of living within a space for you and your family. Don’t be seduced by style over substance. Keep the number of finishes to a minimum. This ensures continuity of design. Not everything you love will work within the space. Be true to the style of the architecture. Be true to the style of the architecture of the property. Even if original features have been ripped out over the years, it is wise to reinstate these details in a period property from an aesthetic viewpoint but also for resale. Not every space needs filling with furniture. The feeling of space is created by leaving space. The feeling of space is also created by opening up previously partitioned rooms, but replacing these walls with glass or Crittall style doors is a contemporary way of opening up a space.